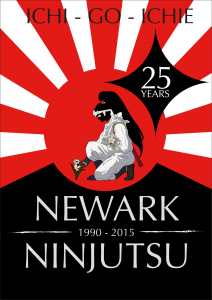 BBD Newark Ninjutsu was established in October 1990 by Kiyth Fotitt under the authority of Chief Instructor, Shihan Brian McCarthy. We are a progressive ninjutsu training group, and the only Bujinkan Brian Dojo, training group covering the whole of the East Midlands. The dojo is run by Shidoshi-Ho’s, founder and senior instructor, 4th dan Kiyth Fotitt, 2nd dan’s, Andy Osborn and Matt Clark and Shodan, Alex Espin. Collectively, the instructors have over 80 years of experience in Ninjutsu, CQB, self defence and other martial arts. The dojo has twice been nominated as finalists in the Newark Business Awards for “service committment to the Community” in 2011 and 2012. In 2013, Kiyth was awarded the Mayor’s Award for Sport. You can find us on the banks of the River Trent at Farndon. Our dojo is at 6th Newark Sea Scout Group HQ, “Riverside”, (adjacent to Farndon Marina off North End) Farndon, nearNewark in Nottinghamshire,NG24 3SX. It has indoor and outdoor training facilities, a wonderful training environment and ample free parking space. Maybe you’ll find us in a field or in the river, on the beach or in the glades. Ninjutsu gives us a great many skills within a single training organisation. We have developed as a “family” and encourage camaraderie , not just between instructors, but between all the students. We get a sense of belonging, not just to our dojo family but our fellow students in other dojos across Europe and to our heritage. To benefit from ninjutsu you need to have an open mind and train for the long tern. It is a living art, forever changing. All year round except over the Christmas and New Year period. We currently hold two national courses each year at our Newark dojo and the European Matsuri (summer festival) over a weekend in June.